I drove out to Spencer, Indiana this past Sunday afternoon to capture drone footage of the White River cresting for The Herald-Times. According to the paper, the river crested at 23.22 feet, the worst flooding in the town since 2008. 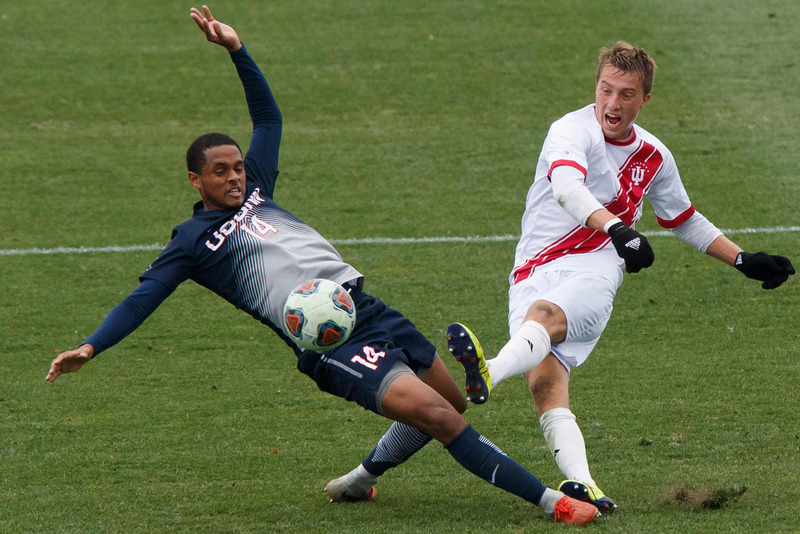 Just like most photographers, I shoot a ton of sports. This year was no exception. Compared to the past few years, it seems like I shot a wider variety of sports this year than usual. I shot a few sports I had never photographed before including hockey, golf and soccer. So continuing with the year in review posts, here are my 15 favorite sports shots from this year. 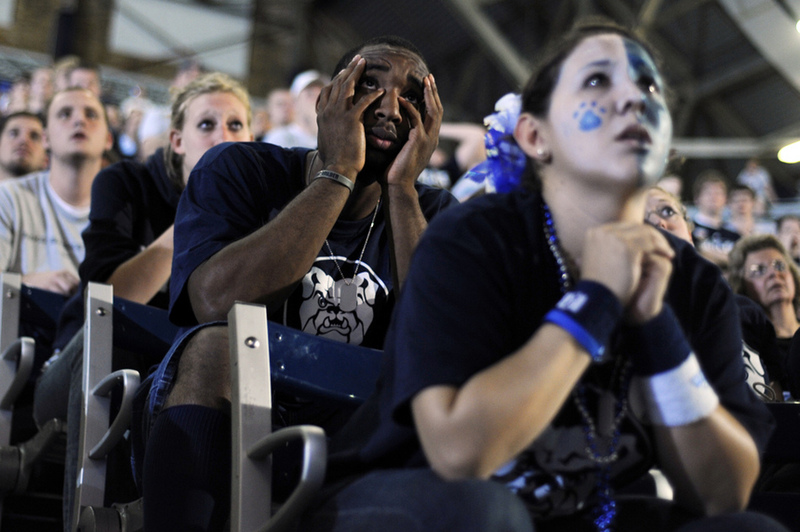 James Poscascio, a freshman at Butler, watches the action between his fingers during a viewing party of the Duke-Butler national championship game on Monday, April 5, 2010, at Hinkle Fieldhouse in Indianapolis. 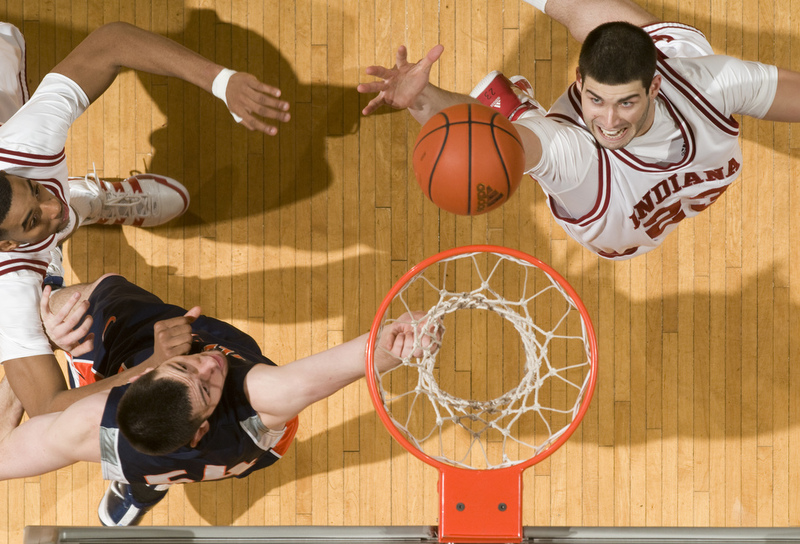 Indiana forward Bobby Capobianco, right, reaches out to grab a rebound in front of Illinois center Mike Tisdale during the second half of IU's 66-60 loss to Illinois on Saturday, Jan. 9, 2010, at Assembly Hall. It’s been a pretty good year for me. I graduated college, completed three internships and got a job. I also made a few good pictures along the way. Going through my archive recently, I compiled a gallery of the year in pictures that includes 75 photos. It’s a chronological gallery that shows what I’ve been up to this year. Figuring most people wouldn’t want to look at 75 photos, I edited down to my 15 favorites from this year. It’s been a fun year, but I’m very excited to get started in Wyoming in 2011. 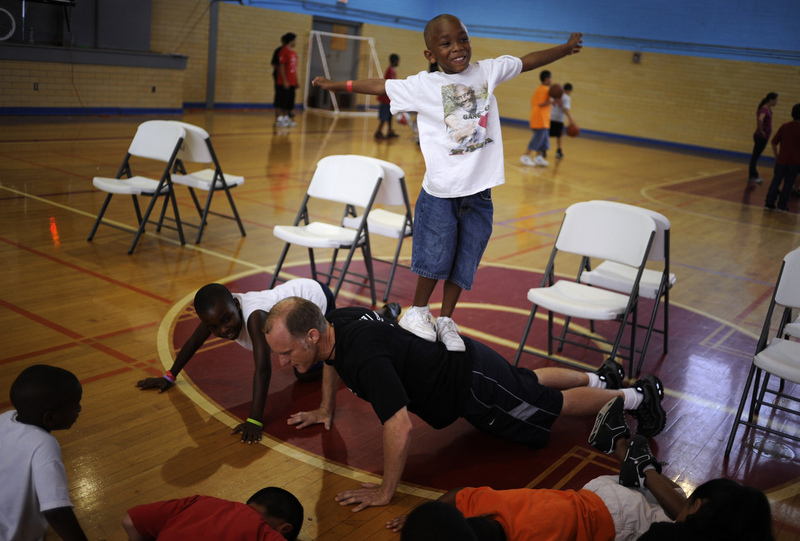 Larenz Dempz, age 7, tries to keep his balance as he stands on Brian Beavliev's back during a push up at the East Boys and Girls Club in Austin on Wednesday, June 16, 2010. Area youngsters participated in a Police Activities League basketball camp at the gymnasium. Master Gunnery Sgt. 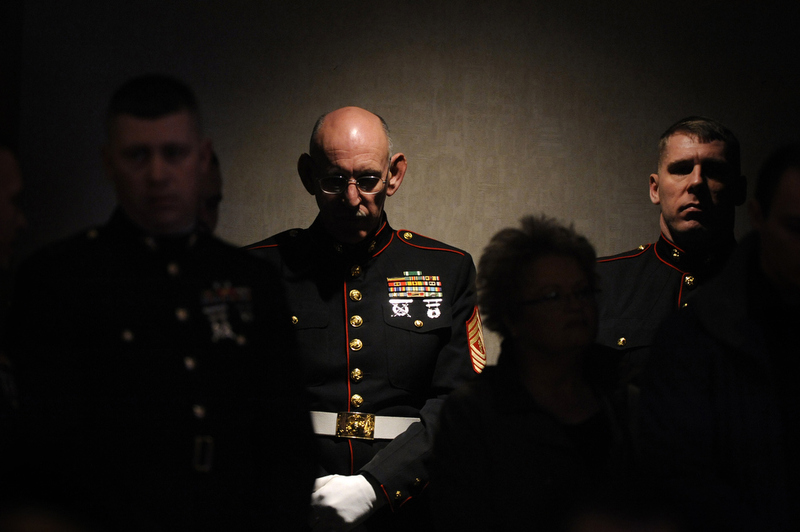 John Lund, a member of the Marine honor guard, listens to a memorial ceremony for Sgt. Jeremy McQueary on Sunday, Feb. 28, 2010, at The Seasons Lodge and Conference Center in Nashville, Ind. Lund, a veteran of the Vietnam War, Gulf War and Iraqi War, folded a flag in McQueary’s ceremony. McQueary, 27, was killed in the Helmand Province in Afghanistan on Feb. 18. 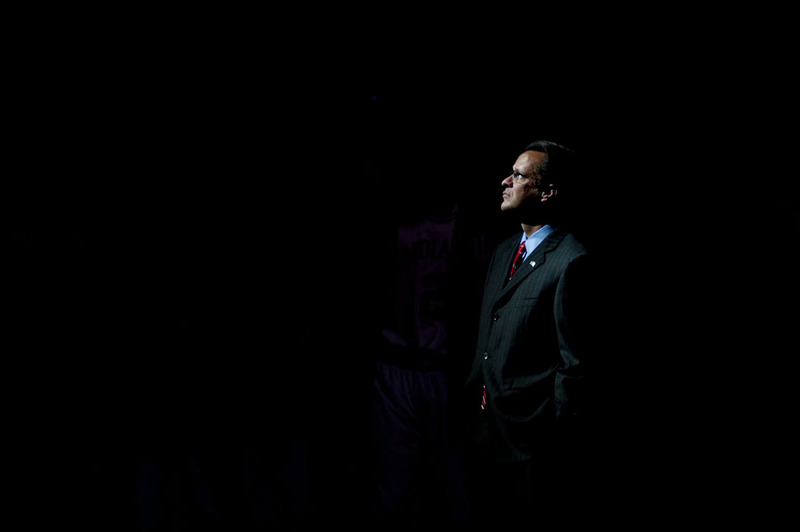 Indiana coach Tom Crean waits for player introductions to begin before a game on Tuesday, Nov. 16, 2010, at Assembly Hall. For this year’s Little 500 race, I decided to take a different angle than usual. It was my fourth time covering the race as a student, and I wanted to try to tell the story differently. Instead of just focusing on the race-day peak action and reaction shots, I teamed up with a writer to tell the story of a single team in the race. We embedded with Emanon, a first-year independent team in the field. Emanon was formed by Alpha Tau Omega members after the school’s chapter was not allowed to compete in the race after an ethics board review and alcohol violations. I produced an audio slideshow, and fellow Herald-Times intern — and soon-to-be Chicago Tribune intern — Ryan Gregg wrote a narrative about the team. Emanon team leader Derek Bailey adjusts his headband and helmut as he prepares for the team send off on Saturday, April 24, 2010, at the Alpha Tau Omega house. Several hundred members of ATO gather each year to send off the Little 500 team on the day of the race. 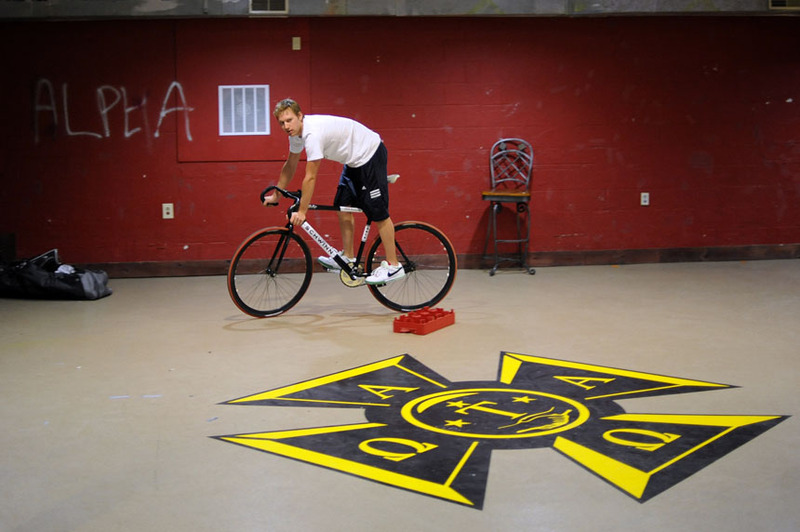 Emanon rider Alex Ray takes a team bicycle for a spin in the basement of the Alpha Tau Omega house on Wednesday, April 21, 2010, in Bloomington, Ind. The team met at the house to do a few last-second tweaks to their bicycles before turning it in for pre-race inspection the next day. Teter rider Susan Laurie, right, reacts with teammate Lauren Gowdy after winning the Women's Little 500 on Friday, April 23, 2010, at Bill Armstrong Stadium. Teter rider Dana Vandergenugten, middle, celebrates with her teammates after winning the Women's Little 500 on Friday, April 23, 2010, at Bill Armstrong Stadium. 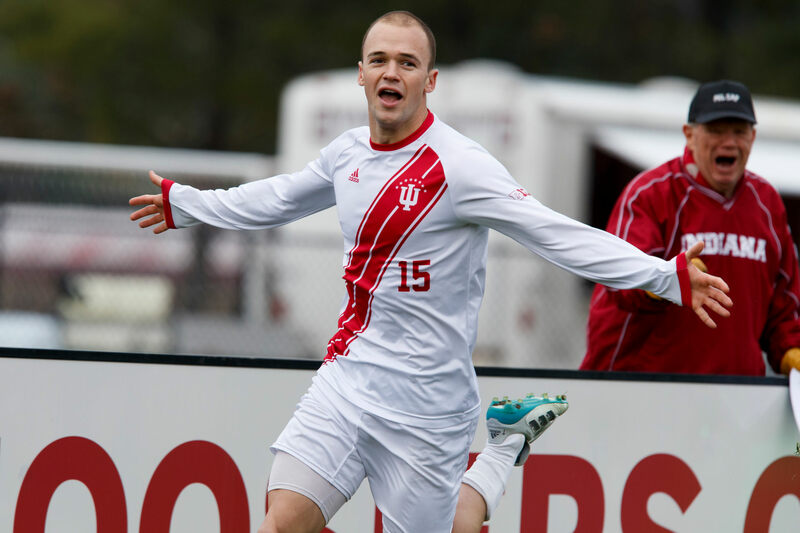 It was Teter's first win since 2005. I ended up only shooting the first half of the race. I had a fever and I was able to leave during a red flag for thunderstorms and lightning at lap 104/200. This was my fourth – and possibly last – time covering the race so I was disappointed to to be there for the finish. It will probably go down as one of the best Little 500 races in recent memory despite the rain. The Cutters’ Eric Young, pictured below, broke away from the pack on the last lap to secure the team’s fourth consecutive win. 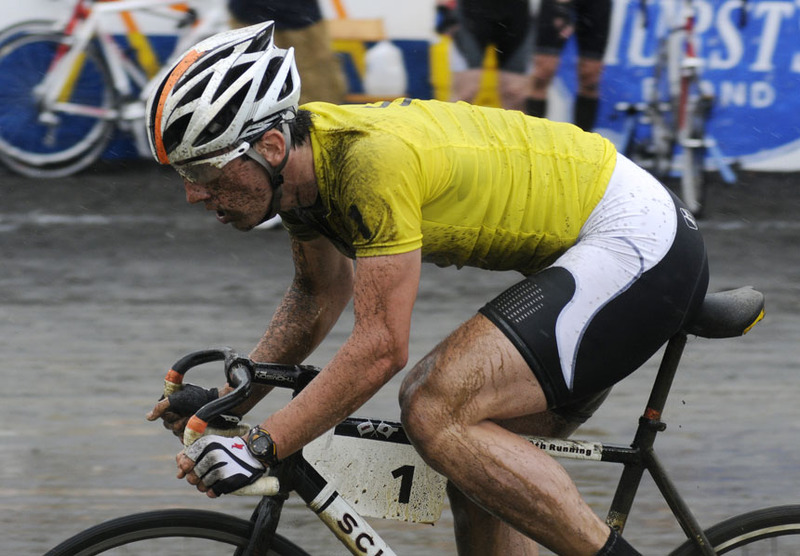 Cutters rider Eric Young speeds down the back stretch in pouring rain as he breaks away from the group of leaders near the middle of the Men's Little 500 on Saturday, April 24, 2010, at Bill Armstrong Stadium. The race was red flagged near the midpoint of the race to allow a thunderstorm with lighting to pass. 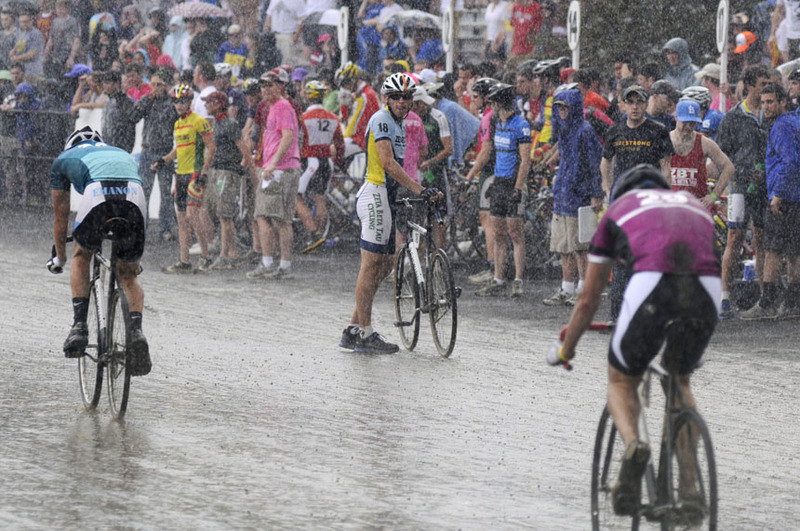 A Zeta Beta Tau rider waits to make an exchange midway down the backstretch as rain pours during the Men's Little 500 on Saturday, April 24, 2010, at Bill Armstrong Stadium. The race was delayed on lap 104 due to thunderstorms and lightning in the area. This was definitely one of the toughest assignments I’ve shot this year. It wasn’t because of emotional or technical reasons, but because I was feverish the entire day. I had been sick in the days leading up to the event, but I didn’t want to miss an opportunity to photograph the Little 500. I felt better as I headed out to the track, but by the end of the day I was at about 30 percent. Teter rider Lauren Gowdy, right, celebrates with teammate Dana Vandergenugten after the team won the Women's Little 500 on Friday, April 23, 2010, at Bill Armstrong Stadium. Teter scored it's first victory in the race since 2005. Teter rider Caitlin Van Kooten receives a hug after the team won the Women's Little 500 on Friday, April 23, 2010, at Bill Armstrong Stadium. It is the team's first win since 2005. 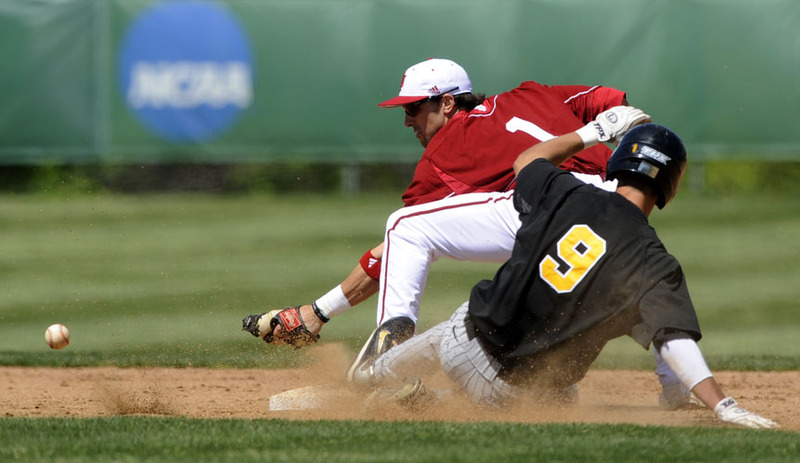 Iowa's Trevor Willis (9) slides into second as an outfielder overthrows Indiana's Tyler Rogers (1) during a game on Sunday, April 18, 2010, at Sembower Field.